After hearing everywhere that content marketing is the best way to grow your real estate business, you are ready to try it for yourself. That’s great – but before you can start using real estate content marketing, you need understand exactly what it is. This post covers the basics of content marketing for real estate: what it is, what it can accomplish, and how you can use it to build your real estate business. What is content marketing for real estate? The real estate market is so highly competitive that it can be difficult for real estate agents to gain the attention of homebuyers. Over 90 percent of realtors have a website, (according to NAR) so simply waiting for leads to find your site isn’t going to work. 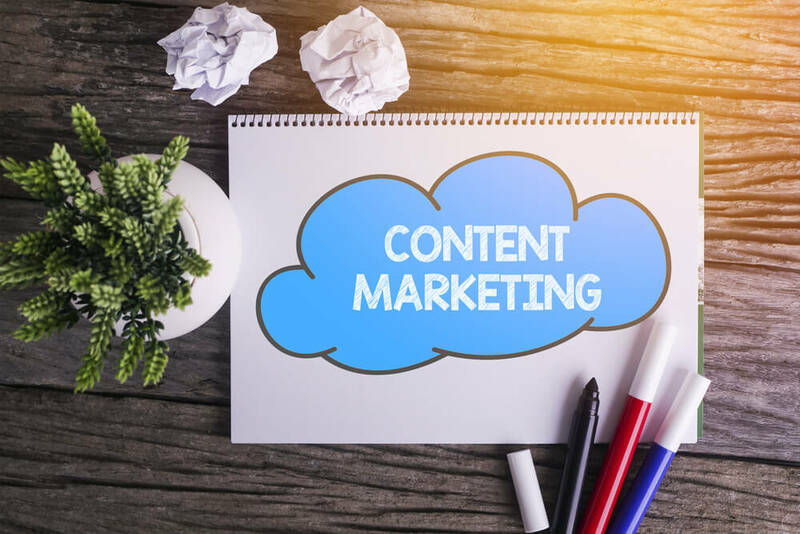 Content marketing for real estate is the process of using blogs, videos, social media posts, e-books, and other content to generate organic traffic to your website, gain the attention of homebuyers, and generate online leads. How can content marketing help my real estate agency? Content marketing offers several benefits that make it particularly helpful for real estate agents and brokers. What are some examples of real estate content marketing? Is content marketing for real estate hard to do? Blogging and other forms of content writing for real estate websites is different from simply writing about real estate topics. You already have the knowledge you need to create real estate content that will be helpful for clients, but that alone isn’t enough. Real estate content also needs to have certain qualities to satisfy Google and the other search engines. Making sure your content contains these factors is known as SEO or search engine optimization. In order to be effective, real estate content marketing needs to start with researching the latest trending keywords, including voice search phrases. Real estate blogs need to have SEO-rich titles and headlines, backlinks and internal links. Videos need to include keywords in Alt tags and descriptions, and social posts need #hashtags that include trending real estate keywords and links to your other content. How can I learn to use content marketing for real estate? There are many free resources online that can help you learn the fundamentals of content marketing for real estate. You can learn more of the basics through our blogs here at For Sale Marketing – you can find lots of helpful advice on how to create effective content for real estate blog use, social marketing advice, email marketing tips, and more. We have tips on choosing topics, SEO checklists, and more to make your content marketing more effective. What professional content marketing services are available for real estate? real estate web marketing agency, we can help you with all or some of your content marketing chores. We offer real estate SEO-friendly blog writing services, social marketing packages, website copy creation, email services, and more, expertly designed to help your real estate agency succeed. Contact us at For Sale Marketing today at (954) 866-1118 for content marketing services that will help your real estate company succeed!